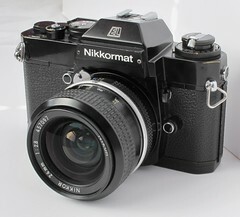 The Nikon Nikomat EL (in Japan) or Nikkormat EL (elsewhere) was introduced in 1972. 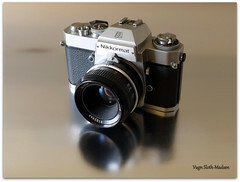 It was one of Nikons first attempts with producing a camera with electronics. Features electronic controlled shutter at 4 seconds to 1/1000. Aperture-priority automatic exposure, with center weighted CdS meter cell. Electronic flash sync is at speeds up to 1/125th second. Flashbulbs at speeds from B to 1/l000th second. Runs off a PX28 6.2 volt silver-oxide battery, inserted into a chamber inside the mirror box. The camera is considered a tech's nightmare, due to the hardwiring of the electronics. 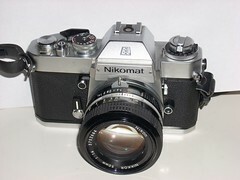 The Nikomat ELW (in Japan) or Nikkormat ELW (elsewhere) was introduced in 1975. Black version of EL, with secondary power switch around shutter release, plus contacts for AW-1 autowinder. First of a series of pages on the Nikkormat EL at the Nikkormat site within "A Pictorial History of Nikon Cameras"
First of a series of pages on the Nikkormat ELW at the Nikkormat site within "A Pictorial History of Nikon Cameras"
This page was last edited on 11 February 2019, at 05:14.